I had this wonderful idea on Saturday to paint the cabinets in our laundry room. 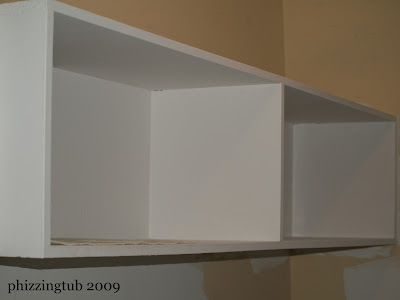 I removed all the stuff that was stored on/in them, sanded them off and then painted them white. Now, since I painted the cabinets you know what was going to be next. Dh and I picked out a white that has just a subtle green tint. My goal is to tackle painting above the cabinets and around the door frame tomorrow night. Then tackle the wall by the dryer on Friday and the last wall over the weekend. 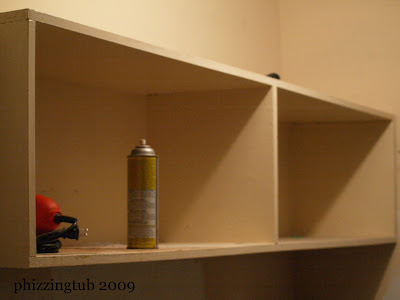 There are some ClosetMaid shelves (on the last wall) that need to come down before I can paint. Trust me; my fingers are crossed that I will be able to get it all done. Perhaps I might even be able to find someone to rid us of the horrid flooring that is in the room next. I will spare you the torture for now but you will be seeing it at some point.